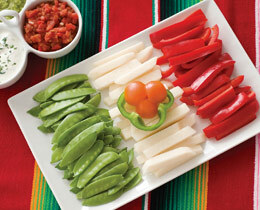 If you have plans to celebrate Cinco de Mayo, this veggie tray from Family Fun is a perfect snack for your celebration. Peas (I would go with sugar snap instead of snow peas personally), jicama, and red bell peppers) are all easy to find and inexpensive. You could stop there, but it is pretty easy to add the green bell pepper and tomatoes. This would be fun to bring into school when your kid is giving a report on Mexico too! And it could easily be switched up for just about any country. You might have to use fruit though. Maybe a strawberry and blueberry Union Jack for your Royal Wedding get together.